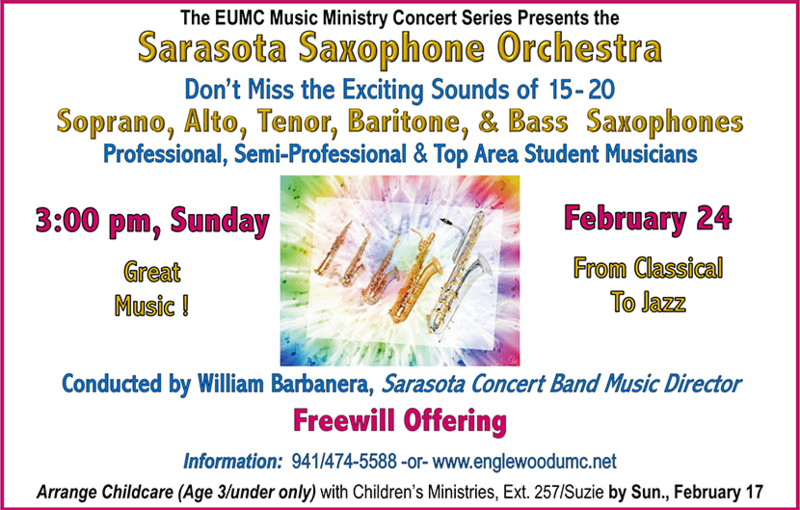 William Barbanera, Artist Director/Conductor of the Sarasota Concert Band returns with professional, semi-professional, and top area student musicians to treat the audience to an impressive array of classical music and a touch of jazz. Music lovers of any age will enjoy this unique ensemble or 15 to 20 soprano, alto, tenor, baritone, and bass saxophones. Available for childen Age 3 & under only. Free at each concert. Except for Sunday worship services, pre-registration is required by Sunday, February 17th.